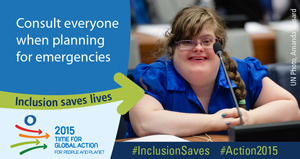 Ensuring the inclusion of persons with disabilities in all aspects of disaster risk reduction efforts can save lives. Persons with disabilities are a unique resource of knowledge and experience, which is often overlooked, that is essential to help reduce the risk of disasters and build resilient societies and communities. A barrier-free environment helps to ensure full and equal participation in society by all, regardless of age, gender or ability. During the past decade, the world has witnessed an increase in the number of major disasters, including the Asian tsunami in 2004, the Haitian earthquake in 2010, the 2011 Great East Japan Earthquake, and the 2012 Hurricane Sandy in the United States. Persons with disabilities, when compared to the general population, face higher risks in emergency situations and are disproportionately affected by natural disasters. Available data reveals that the mortality rate of the disabled population is also much higher than that of the non-disabled population in many disaster situations. People with disabilities have the experience and resilience to help find solutions when planning for disasters and emergencies. The Third United Nations World Conference on Disaster Risk Reduction (3WCDRR) will take place from 14 to 18 March 2015 in Sendai, Japan. Based on the first Hyogo Framework of Action (HFA), the international community is moving forward with the post-2015 International Framework on Disaster Risk Reduction (HFA2) that will be adopted at the 3WCDRR. This framework will guide and support global efforts at all levels to build nations and communities that are resilient to disasters. Ensuring the inclusion of persons with disabilities in all aspects of disaster risk reduction efforts can help develop better strategies and save lives in emergency situations. Think DiDRR: Disability-Inclusive Disaster Risk Reduction! To advance action at all levels to include persons with disabilities, their perspectives, knowledge and experience, in disaster risk reduction and resilience-building. What can you do for DiDRR? Include: Look for opportunities for participation by all stakeholders – Governments, the UN system, civil society and organizations of persons with disabilities – to focus on issues related to the inclusion of persons with disabilities in DiDRR, both as beneficiaries and agents. 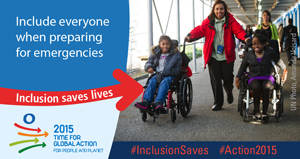 Persons with disabilities have unique perspectives, reslience and abilities that can add immense value in preparing for and in emergency situations. Does your office, school or communty have an emergency evacuation plan that includes persons with disabilities? Do they conduct fire or evacuation drills-drills that include “everybody”? Organize: Hold forums, public discussions and information campaigns to help find innovative ways and means by which the expertise, perspectives and needs of persons with disabilities and their families can be further included into DRR strategies in planning for emergency situations. 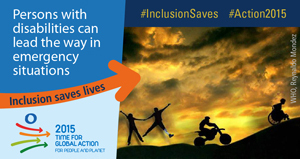 Create your own “Inclusion saves lives” disability-inclusive emergency programme in your local school, office or community! 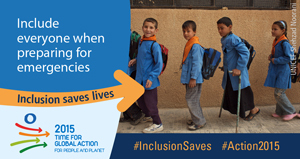 Take Action: A major focus of the year 2015, is a Time for Global Action for People and Planet, is to take practical and concrete action to include disability perspectives in all aspects of DiDRR, as well as to further the inclusion of persons with disabilities in preparing for emergencies on the basis of equality. Highlight progress and obstacles in implementing disability-sensitive DRR policies, as well as promote public awareness to break barriers and open doors: for an inclusive society for all. Did you successfully overcoming a natural disaster or emergency situation? Tell us your story! Share your story to help us highlight good practices and lessons learned in including the needs and perspectives of persons with disabilities – before, during or after – disaster and emergency situations. Stories should be under 300 words and emailed to enable@un.org, with the Subject: Inclusion saves lives story and include a photograph. Stories must include facts about real situations and actions taken in your neighbourhood, school, office, community, etc. What barriers and challenges were faced before, during or after a disaster or emergency situation and how were they overcome? Does your neighbourhood, school, office, community, etc. have an emergency plan that includes persons with disabilities? Do periodic fire or evacuation drills include everybody? Describe something unique about it. Let us know what Governments and local organizations of persons with disabilities have done to include everyone in disaster and emergency situation planning, recovery efforts and reconstruction?